Very popular in seed catalogs from the 19th and early 20th centuries; this variety was then praised as the best for pies among many seedsmen, who had an impressive list of virtues for this squash, such as this 1918 listing from Great Northern Seed Co: "A magnificent pear-shaped variety of fine size, a little ribbed; color creamy white, sometimes striped with green. Has no superior for making pies and custards; when cooked it has somewhat the appearance of sweet potatoes, but of more delicious taste. Flesh thick, creamy white, remarkably fine grained, dry and brittle, hardy and productive and keeps perfectly sound until late in the Spring." We find the above description a little bit of a stretch as far as its pie making qualities and the "better than sweet potato-ness"; however, this type of squash can really be great when fried in a skillet with onions, garlic and a little salt, and they kind of taste like regular potatoes, only more flavorful and delicious. Beautiful, pear-shaped fruit are white with faint green stripes, making this variety very ornamental as well. 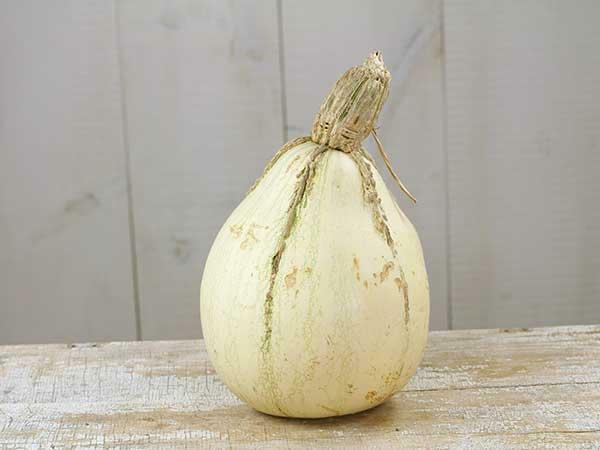 Tennessee Sweet Potato Squash is possibly the same squash as that which was listed in 1847 by Grant Thorburn (seed merchant in New York), as "Green Striped Bell." The "Tennesse Sweet Potato" name seems to have appeared in 1883, and been coined by W. Atlee Burpee Company. 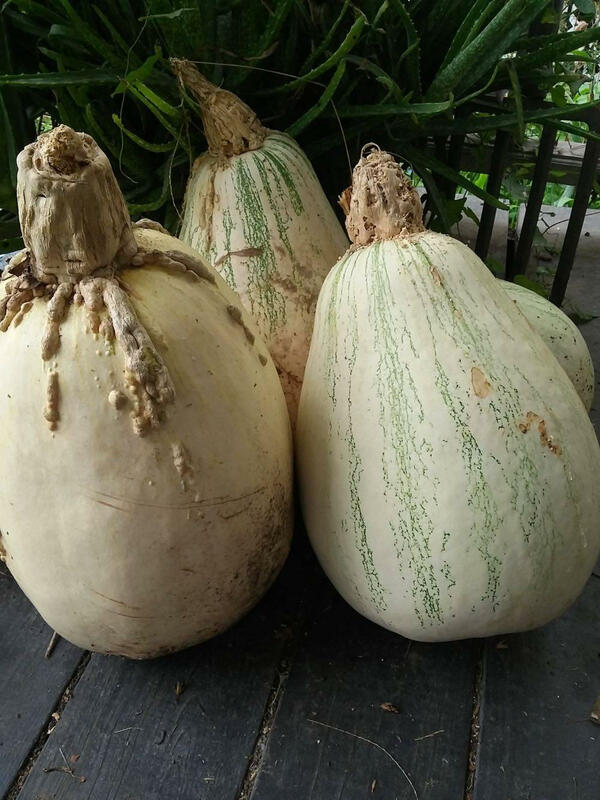 "Grows to medium size, pear-shaped, a little ribbed, color creamy white, sometimes lightly striped with green, flesh thick, creamy white, remarkably fine grained, dry and brittle, and of most excellent flavor. 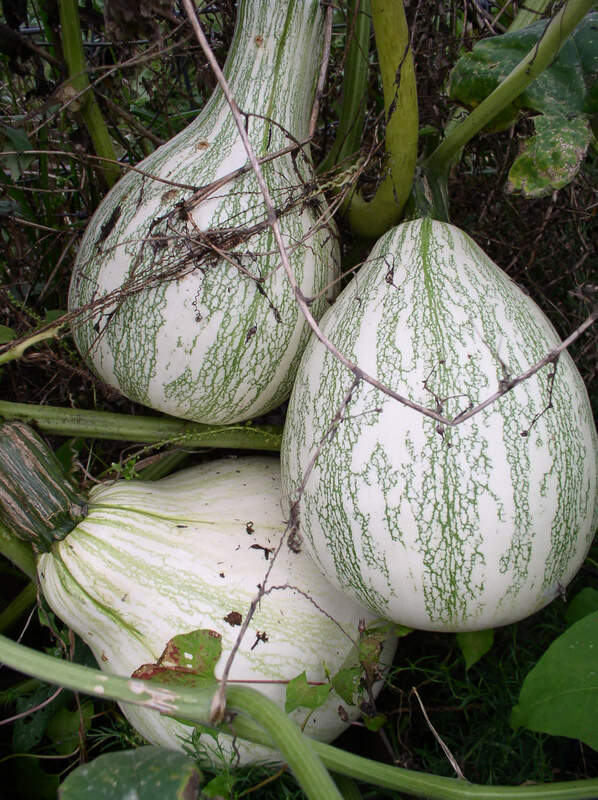 Hardy, very productive, and keeps perfectly sound until late in the spring, longer than any other pumpkin. It speedily becomes a general favorite wherever it has been introduced. Has no equal for making pies and custards. When cooked it has somewhat the appearance of sweet potatoes, but of more delicious taste. 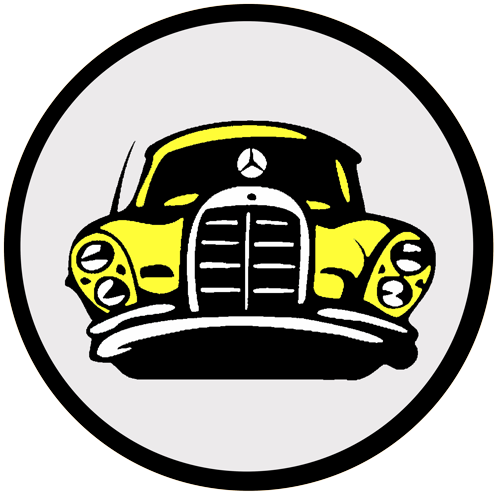 It proves very distinct and fixed, and is a valuable acquisition. This variety we recommend as being superior to any other variety of pumpkin for cooking purposes in cultivation. Its attractive appearance makes it a specially valuable kind for the market gardener. Our stock of this variety is grown with special care, and cannot fail to give satisfaction to our patrons, but the seed being very scarce, we can sell it only in packets. Do not confound the Tennessee Sweet Potato Pumpkin with any other so-called Sweet Potato Pumpkin." Sources: "Vegetables of New York: Vol.1 - Part IV - The Cucurbits," by William T. Tapley, Walter D. Enzie, Glen P. Van Eseltine, 1937. "Burpee's Farm Annual for the Southern States," 1883. 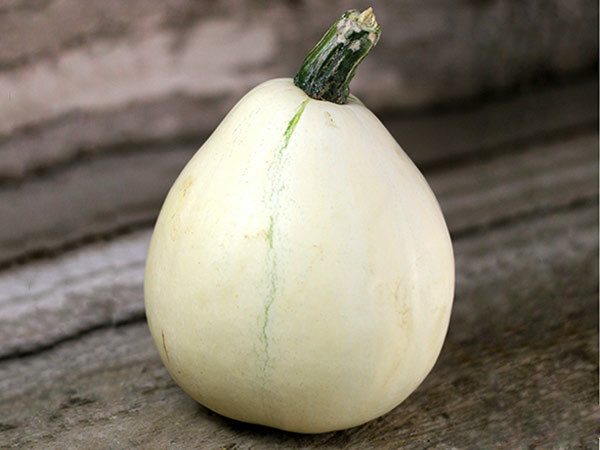 A unique pear-shaped pumpkin with lovely white skin. The vines give good yields of 10 lb fruits. Creamy yellow flesh makes great pies. An heirloom that has been grown by the Fortna family of Pennsylvania for more than 60 years. Rare and unusual. MD, USA: Pros:Great taste; makes great pies. Cons: none. These pumpkins have been in my family for years and are named for my uncle Wayne Fortna who was famous for them. They make wonderful eating and are easy to grow and prepare. They are a very convenient size, not being tremendously large, and have an unusual white skin with a yellow/orange flesh.